The problem of compatibility between wireless devices is being addressed at an international conference this week. Scientists will be discussing what has been dubbed "Tower of Babel" technology - software that can converge different wireless gadgets into a single device. The aim for Software Defined Radio (SDR) is to be able to translate and understand any kind of radio wave signal, such as 3G or wi-fi. Researchers say SDR gadgets could become commonplace in five to 10 years. Dr David Ndzi from the University of Portsmouth, where the International Conference on Telecommunications and Computers is being held, said: "SDR is what one could call a Tower of Babel-type technology, in that wireless devices that previously understood only one or a few languages, or standards, will suddenly be able to talk to each other freely regardless of frequency or conflicting protocols." European space firm EADS-Astrium will be talking to delegates about its research in this emerging field. Francis Kinsella, a specialist engineer from the company, said: "If you were to go on a hill-walking trip, you might have a walkie-talkie to talk to friends who are not far away, a mobile in case of emergency, GPS, a Bluetooth connection and even a laptop or PDA with a wireless LAN connection. "Every single one of these things is a radio, and they are all slightly different. 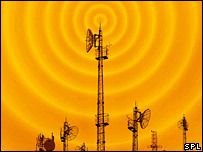 But in the future, with Software Defined Radio, all you need is one thing that can do the job of all of these devices." The idea behind SDR is that an aerial in the device picks up radio signals passing through the air waves. An analogue-to-digital converter transforms this signal into a digital format, which can be understood and manipulated by software onboard the device. Currently, most devices rely on hardware, rather than software, to get at the information in radio signals. EADS-Astrium is about to launch its first SDR product, a piece of kit to be used by the military that can convert different kinds of signals, but Mr Kinsella said it was still an emerging technology. He said two main limitations have held SDR back: the speed at which analogue-to-digital converters turn radio waves into numbers, and computer power. "But," he said, "we have advances in both of those areas that could really mean an explosion in the next five to 10 years for SDR." He said that the military had driven advances in the technology but the eventual benefits could be felt by consumers. The technology could even prove essential in emergency situations. 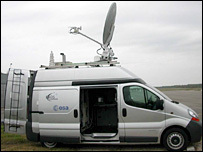 EADS-Astrium is currently working on a portable van, which has a satellite link, GSM, and wi-fi capabilities to be deployed during emergencies, such as in the aftermath of natural disasters. He said the ideal would be to add SDR to the van. The next stage, said Mr Kinsella, would be what is termed "cognitive radio", a technology that has the same capabilities as SDR but also searches for and exploits bandwidth that is not being used. Will 'fourplay' be the next big thing?